We get a lot of questions asking us - what exactly is a 70? What does a neighborhood with a State of Place Index of 50 look like? How does that compare to an 80? Well, you ask and you shall receive! Below is a handy visual guide to the State of Place Index, broken down into five levels of place quality and walkability, profiling one neighborhood in each category. That said, remember that not all 50s, 70s, 80s, etc. are created equally . 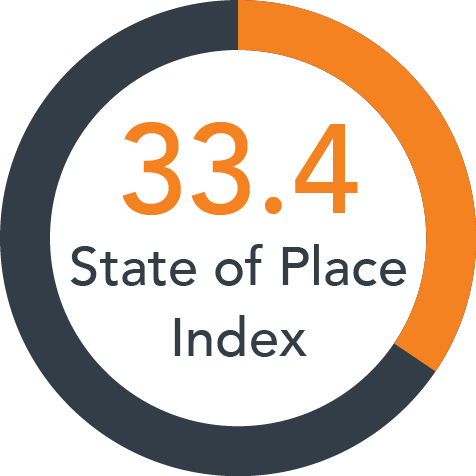 The State of Place Index is composed of ten urban design dimensions and that’s why two neighborhoods with the same Index may have very different Profiles. That’s what makes State of Place so unique - no black box here. We encourage you to look “under the hood” (ahem, we’re not allowed to use car metaphors here at State of Place, so inside the sole?) and discover a neighborhood’s specific assets and needs. For more information about our scoring process itself, please visit our special data geeks section here! Neighborhoods with scores from 80 to 100 are very walkable and have a high quality of place. Only 5% of the neighborhoods in our database actually fall into this category. They all tend to have a balanced mix of uses, ample pedestrian amenities, good urban form and connectivity, and are aesthetically pleasing. Profiled here is Downtown, Washington, DC, with an overall State of Place Index of 90.1. Most notably, Downtown DC’s historic urban fabric makes it very walkable, albeit it’s relatively less dense than many other neighborhoods we’ve scored, likely due to DC’s height restriction. Additionally, the mix of historic and modern buildings make for an interesting, aesthetically pleasing walking experience. Interestingly, Downtown also scored very well in terms of personal safety, showing how much of a transformation it has gone through over the past three decades. However, there is always room for improvement! Namely, the area wants for a more dynamic mix of destinations as well as more public and green space. Neighborhoods with scores from 60-80 are still quite walkable as measured by the State of Place Index. They tend to provide good traffic safety, bike and pedestrian amenities, and offer a fairly good range of land uses. As with the highest level of the State of Place index, only a relatively low percentage of neighborhoods - 6.4% - fall within this range. 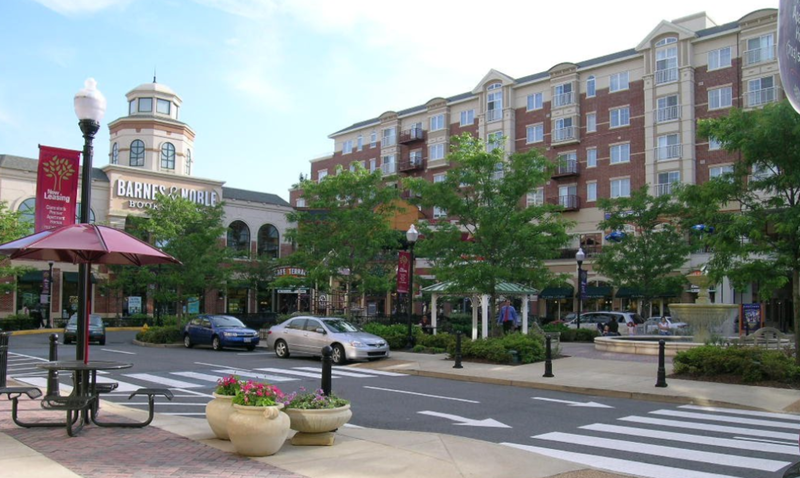 Clarendon, VA is a quintessential "walkable suburban" downtown. 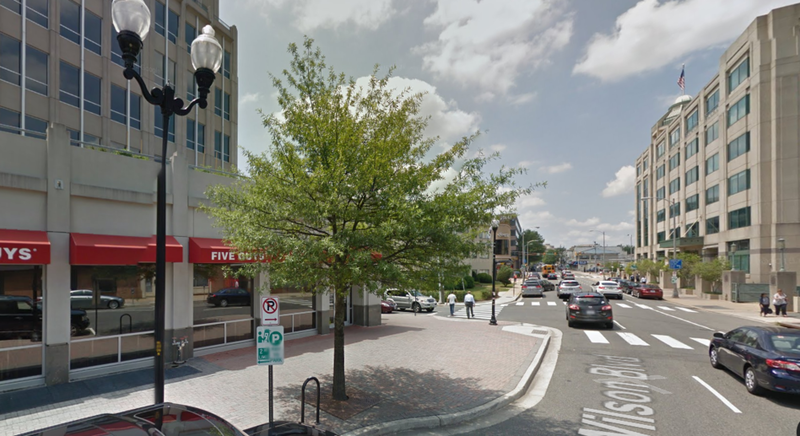 Having undergone a serious walkability “facelift” over the course of more than a decade - perhaps marked by the marquee redevelopment project, Clarendon Commons - the neighborhood offers a very safe pedestrian environment, great connectivity, and nice pedestrian and bike amenities. However, Clarendon can still benefit from a more diverse mix of uses, additional public spaces, and increased building compactness. While a score between 40-60 may sound bad, neighborhoods in this range offer average walkability; indeed, the majority of neighborhoods in our database fall within this range. However, given that the average walkability of neighborhoods in the U.S. isn’t that great to begin with, and in light of the increased desire to "live, work, and play" in walkable places, these neighborhoods are ripe for improvement. 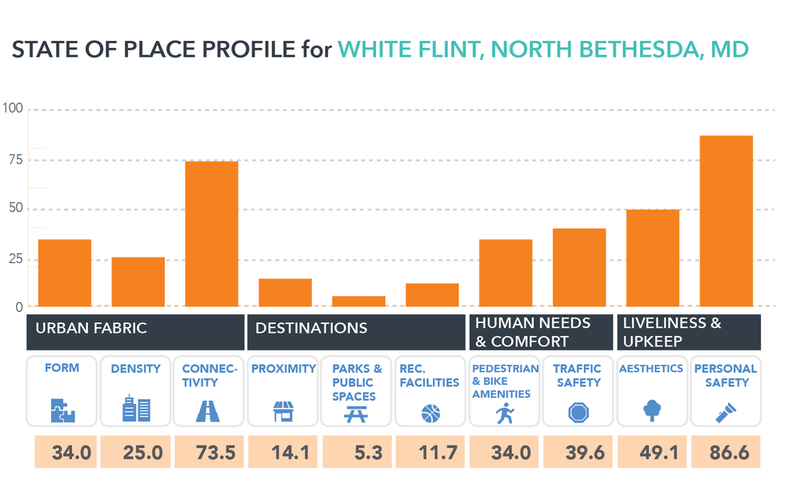 The State of Place Profile is a critical analysis tool for these kinds of places, as the assets and needs of these neighborhoods vary greatly: some neighborhoods severely lack access to destinations, others have dangerous traffic conditions, and yet others offer few if any pedestrian amenities. Neighborhoods in this range must be examined closely - context is key. There is no walkability panacea or one-size-fits-all approach silver bullet. Rockville, MD is a good example of the neighborhoods that fall in this category. While it offers good personal safety and is relatively aesthetically pleasing, it has a low number of accessible destinations and offers few pedestrian or bike amenities. That said, the city has taken significant steps to become more walkable, including the development of their $100 million Town Square, which includes a library, an arts center, restaurants, and a new mixed-use project with a hotel, residences, and shopping. Neighborhoods scoring between 20-40 on the State of Place certainly need some TLC. Comprising about a quarter of the neighborhoods in our database, they typically score well below average on traffic safety, lack pedestrian and bike amenities, and have very few non-residential destinations. Many also have a poor urban fabric. These neighborhoods are fairly car-oriented. 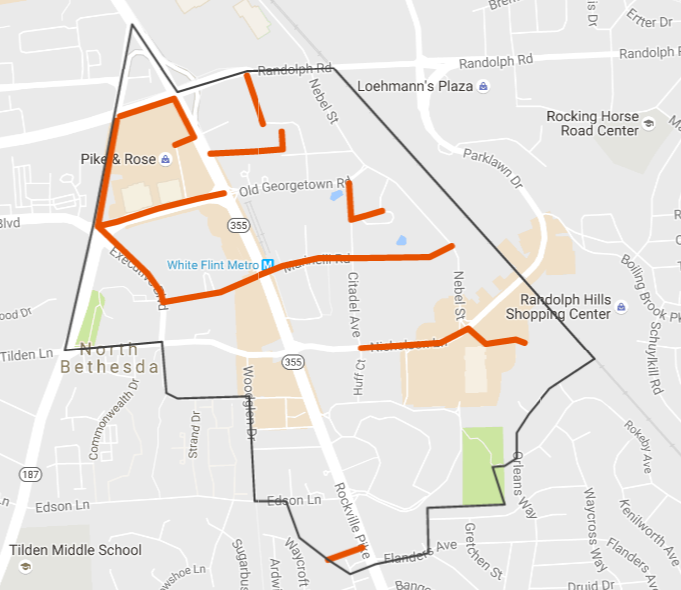 While White Flint, a typical mid-century suburb, currently falls into this category, the city has an ambitious plan to redevelop its now closed mall into a new mixed-use neighborhood. This plan should help boost its currently poor urban form and infuse it with a better mix of uses. 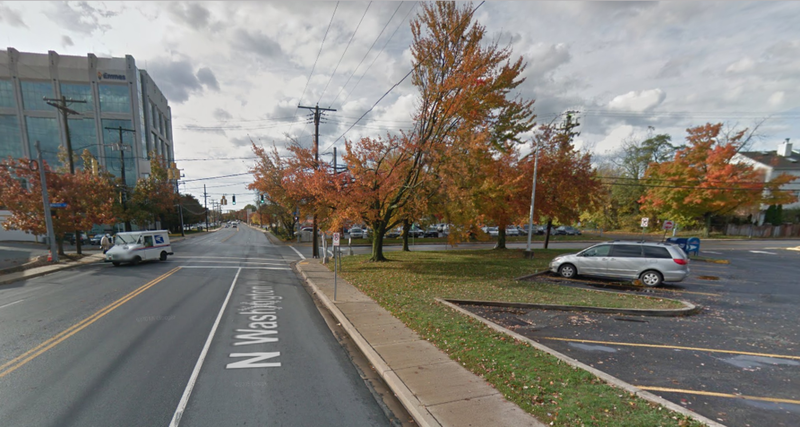 To truly make this area more walkable, this redevelopment project needs to also address traffic safety, offer more pedestrian amenities, and improve aesthetics. Neighborhoods scoring between 0-20 on the State of Place Index are severely lacking in walkability and quality of place. Thankfully, these only comprise 2% of our database. Generally, they score poorly across most of the ten dimensions. 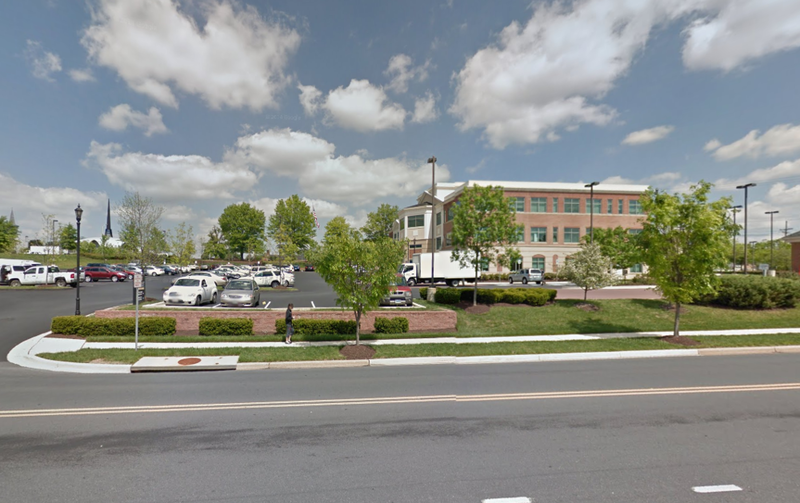 In the case of North Woodbridge, it has very poor urban fabric and very few destinations. It also lacks green or public space, and also scores relatively poorly with respect to aesthetics and personal safety. It is characterized by big boxes, large parking lots, and wide roads, signatures of auto-oriented places. 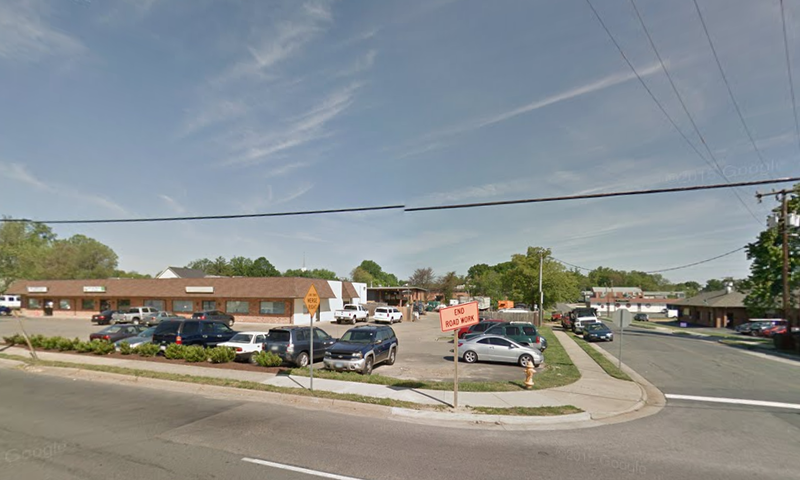 There had been a plan for more compact, mixed-use development for the area, but its status to-date is unknown. 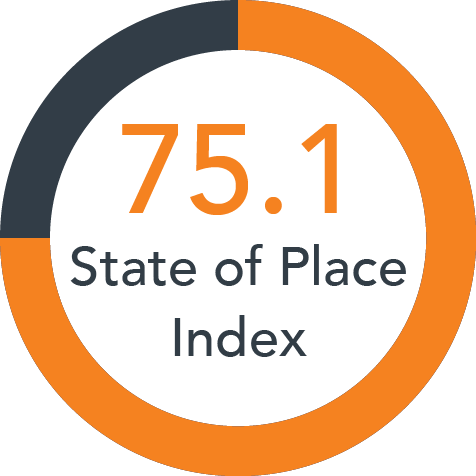 Get Your State of Place Index!